He came into exile in 1991 and studied great collection of Buddhist philosophical treatises with Khenchen Kunga Wangchuk for more than two decades. Likewise he received many transmission and teachings on various collections and works. From master like HH Dalai Lama, Sakya Trichen, Luding Khenchen etc he received numerous initiations and instructions. He served as disciplinarian in 1999, as a review teacher in 2000 and next five years as a teacher. He was given the title of Khenpo by Khentse Rinpoche in 2004. Went to teach at Taiwan for a year in 2006. For next three years he served the Shedra as a principal. 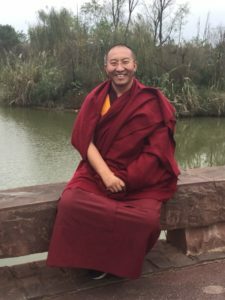 He collected the recordings of Khenchen’s teaching and founded a committee to edit the collected works of Khenchen Kunga Wangchuk. He returned back to Tibet in 2010 and taught at his own village for a year and stayed in retreat at Dzongsar Guge for two years studying mainly with Khenpo Jamseng and others.